Our website is sponsored by AdvancedWriters – professional writing service designed for busy students. With Custom writing service students never worry about essay writing. Besides that, we offer Assignment help online for students provided by homework writing company. In addition, many college students find that writing a dissertation is a challenging job, luckily you can buy dissertation online and receive the most professional help.On top of that, We found the trusted writingspro.com. An American essay writing service, where all writing burden is relieved. 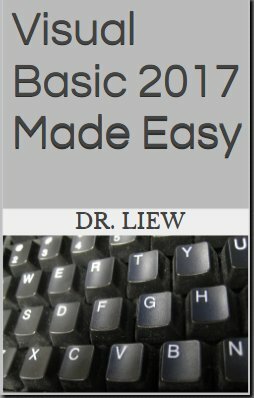 Dr.Liew has released his latest Visual Basic Made Easy series book, Visual Basic 2017 Made Easy. This book was written to complement our free online Visual Basic 2017 tutorial. 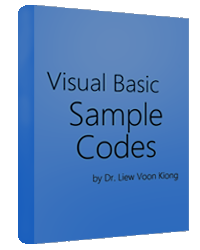 Be the first one to download this book and learn the newest Visual Basic.NET programming language. Besides that, he has also authored several Visual Basic Made Easy Series books that are available in digital versions for your mobile devices and Kindle. These books are excellent reference text for high school or college-level computer science courses. Visual Basic is a third-generation event-driven programming language first released by Microsoft in 1991. The final version was Visual Basic 6. VB is a user-friendly programming language designed for beginners. Therefore, It enables anyone to develop GUI window applications easily. Many developers still favor VB6 over its successor VB.NET. In 2002, Microsoft released Visual Basic.NET(VB.NET) to replace Visual Basic 6. Thereafter, Microsoft declared VB6 a legacy programming language in 2008. However, Microsoft still provides some form of support for VB6. VB.NET is a fully object-oriented programming language implemented in the .NET Framework. It was created to cater for the development of the web as well as mobile applications. Subsequently, Microsoft has released many versions of VB.NET. They are VB2005, VB2008, VB2010, VB2012, VB2013, VB2015 and VB2017. Although the .NET portion was discarded in 2005, all versions of the Visual Basic programming language released since 2002 are regarded as VB.NET programming languages. What kinds of Programs can you create with Visual Basic? The answer is all kinds. For examples, you can use VB to create business applications like inventory management systems, amortization calculator, stock trading program and etc. Besides that, you can create educational programs on topics such as Quadratic Equation Solver, Simultaneous Equation Solver, quadratic graph plotter, simple harmonic motion and so on. On the other hand, you can also create amusing games like Star War, Memory Game, Snakes and Ladders game and more. Last but not least, VB can also be used to write smart contracts on the blockchain. A blockchain is a distributed ledger used by many cryptocurrencies such as bitcoin, ethererum that can be used to record transactions and other data across numerous computers in a peer-to-peer network. In order to view more examples, please visit our sample Codes page.